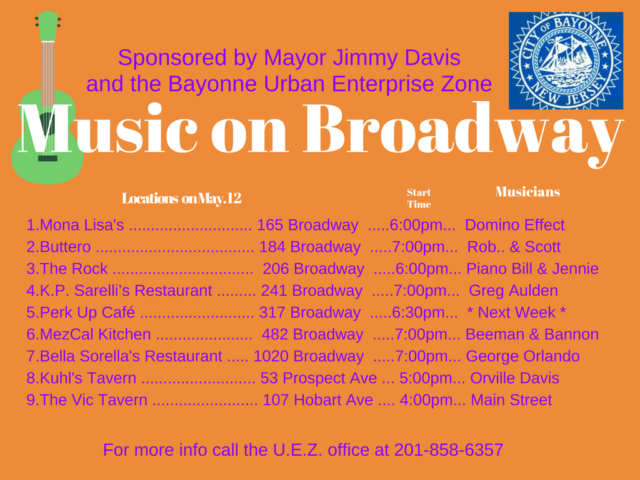 Music Broadway Bayonne Friday, May 12th, 2017 is sponsored by Bayonne Mayor Jimmy Davis and the Bayonne Urban Enterprise Zone a program for the city of Bayonne that is a wonderful way to get out, go for dinner and listen to young talented musicians play while you dine. 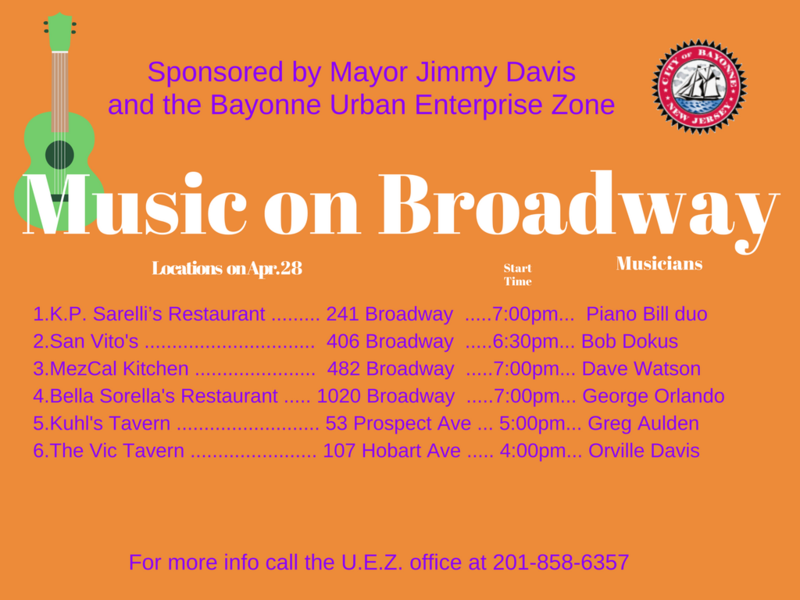 Live Music on Broadway now in its 20th week pairs local musicians with some of Bayonne’s excellent dinner venues. 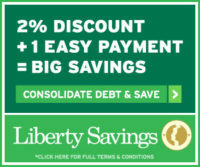 Going out to dine Friday night May 12th ? Visit one of these fine establishments and listen to some fantastic music. Any music at Bayonne restaurants?bayonne gets live musicBayonne Urban Enterprise ZOneBella Sorella BayonneButero's BayonneKP Sarelli's restaurant BayonneKuhl's Tavern Bayonnelive music in bayonneMayor James Davis BayonneMezCal Kitchen BayonneMona Lisa BayonnePerk up cafe bayonneThe Rock BayonneThe Vic Bayonnewho has music in bayonne? Music Broadway Bayonne Friday, May 5th, 2017 is sponsored by Bayonne Mayor Jimmy Davis and the Bayonne Urban Enterprise Zone a program for the city of Bayonne that is a wonderful way to get out, go for dinner and listen to young talented musicians play while you dine. 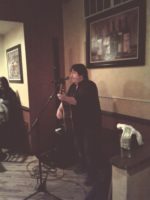 Live Music on Broadway now in its 19th week pairs local musicians with some of Bayonne’s excellent dinner venues. Going out to dine Friday night May 5th ? Visit one of these fine establishments and listen to some fantastic music. bayonne gets live musicBella Sorellas BayonneChances bayonneDomino effectKP Sarelli's restaurant BayonneKuhl's Tavern Bayonnelive music in bayonnemama rosa's bayonneMezCal Kitchen BayonneMusic Broadway Bayonne Friday May 5 2017Piero's music bayonneThe Vic Tavern BayonneWhere is George Orlando playing in bayonneWhere is Paul Addie playing?Who is playing in Bayonne Friday Night? Music Broadway Bayonne Friday, April 21st , 2017 is sponsored by Bayonne Mayor Jimmy Davis and the Bayonne Urban Enterprise Zone a program for the city of Bayonne that is a wonderful way to get out, go for dinner and listen to young talented musicians play while you dine. Live Music on Broadway now in its 17th week pairs local musicians with some of Bayonne’s excellent dinner venues. Going out to dine Friday night April 21st ? Visit one of these fine establishments and listen to some fantastic music. Music Broadway Bayonne Friday, April 14th , 2017 is sponsored by Bayonne Mayor Jimmy Davis and the Bayonne Urban Enterprise Zone a program for the city of Bayonne that is a wonderful way to get out, go for dinner and listen to young talented musicians play while you dine. 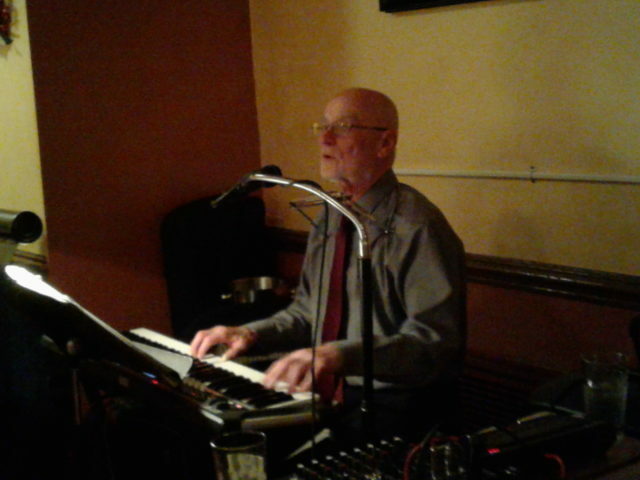 Live Music on Broadway now in its 16th week pairs local musicians with some of Bayonne’s excellent dinner venues. Music Broadway Bayonne Friday, April 7th , 2017 is sponsored by Bayonne Mayor Jimmy Davis and the Bayonne Urban Enterprise Zone a program for the city of Bayonne that is a wonderful way to get out, go for dinner and listen to young talented musicians play while you dine. 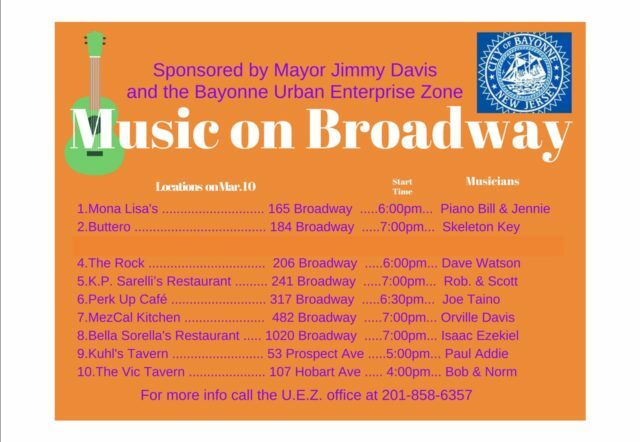 Live Music on Broadway now in its 15th week pairs local musicians with some of Bayonne’s excellent dinner venues. Going out to dine Friday night April 7th ? Visit one of these fine establishments and listen to some fantastic music. bayonne musiciansBella Sorella's Restaurant BayonneKP Sarelli's restaurant BayonneKuhl's Tavern BayonneLive local musicianslive music in bayonnemez cal kitchen bayonnemusic broadway bayonneMusic Broadway Bayonne April 7 2017San Vito's Restaurant BayonneThe Vic Tavern BayonneWho is playing in Bayonne Friday Night? Music Broadway Bayonne Friday, March 24th , 2017 is sponsored by Bayonne Mayor Jimmy Davis and the Bayonne Urban Enterprise Zone a program for the city of Bayonne that is a wonderful way to get out, go for dinner and listen to young talented musicians play while you dine. Live Music on Broadway now in its 13th week pairs local musicians with some of Bayonne’s excellent dinner venues. Going out to dine Friday night March 24th ? Visit one of these fine establishments and listen to some fantastic music. Bayonne live music on FridaysBayonne Mayor Jimmy DavisBayonne Urban Enterprise ZOneBella Sorella's restChance tavern bayonneKP Sarelli's restaurant BayonneKuhl's Tavern BayonneLa Guardiola bayonnelive entertainment in bayonnemama rosa's bayonneMezCal Kitchen BayonneMusic Broadway Bayonne March 24 2017Piero's music bayonnevic tavern bayonnewhere is there live music in bayonne? 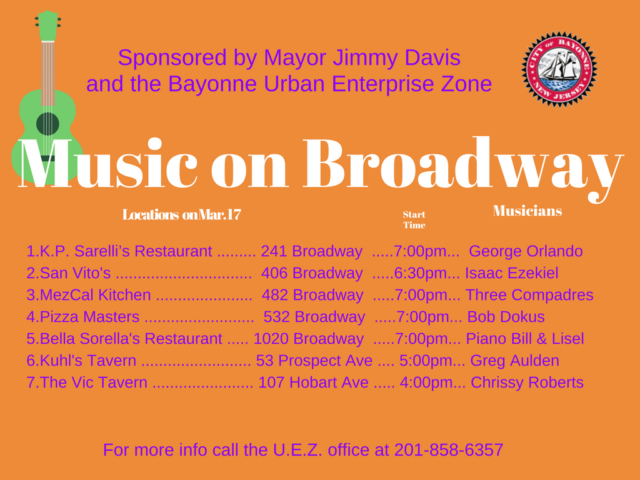 Music Broadway Bayonne Friday, March 17th , 2017 is sponsored by Bayonne Mayor Jimmy Davis and the Bayonne Urban Enterprise Zone a program for the city of Bayonne that is a wonderful way to get out, go for dinner and listen to young talented musicians play while you dine. 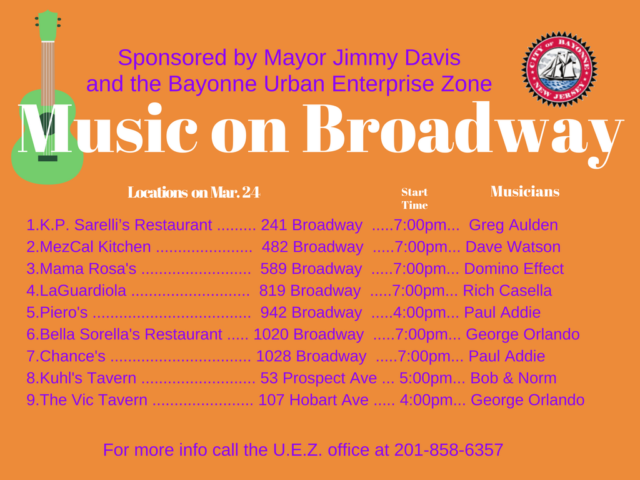 Live Music on Broadway now in its 12th week pairs local musicians with some of Bayonne’s excellent dinner venues. Going out to dine Friday night March 17th ? Visit one of these fine establishments and listen to some fantastic music. Any music at Bayonne restaurants?Bella Sorrellas Restauant BayonneBob DokusChrissy RobertsGeorge orlandoGreg AuldenIssac EzekeilKP Sarelli's restaurant BayonneKuhl's Tavern BayonneLive music at Bayonne VenuesMezCal Kitchenmusic broadway bayonneMusic Broadway Bayonne March 17 2017Piano Bill and LiselPizza MastersSan Vito's Restaurant BayonneThe Three CompadresThe Vic Tavern Bayonnewhat's a good restaurant in Bayonne? 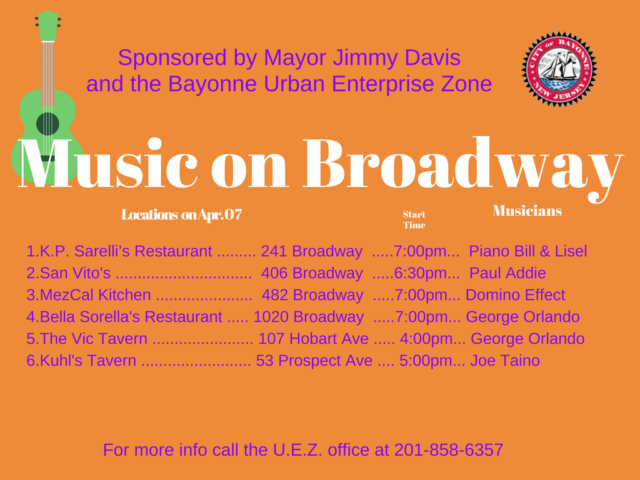 Music Broadway Bayonne Friday, March 10th , 2017 is sponsored by Bayonne Mayor Jimmy Davis and the Bayonne Urban Enterprise Zone a program for the city of Bayonne that is a wonderful way to get out, go for dinner and listen to young talented musicians play while you dine. Live Music on Broadway now in its 11th week pairs local musicians with some of Bayonne’s excellent dinner venues. Going out to dine Friday night March 10th ? Visit one of these fine establishments and listen to some fantastic music.